Thomas E. Fithian, MD, F.A.A.O.S. 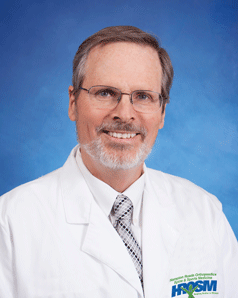 Dr. Thomas Fithian has been providing caring, high-quality orthopaedic treatment to area residents since 1984. He earned his undergraduate degree from the University of Pennsylvania and his medical degree from Columbia University College of Physicians and Surgeons, where he was elected to Alpha Omega Alpha, the medical school honor society. After completing his surgical residency training at Columbia Presbyterian Medical Center and the New York Orthopaedic Hospital, he remained for an additional one-year fellowship in shoulder surgery with the renowned surgeon, Dr. Charles Neer. Since completing that fellowship, Dr. Fithian has been fascinated by the unique problems of the shoulder. In a Hampton Roads Magazine survey that asked local physicians which doctors they would consult for themselves or a member of their family, Dr. Fithian was selected by his peers as a “top orthopaedic” surgeon in 2003, 2008, 2009, 2011, 2012, 2013, 2016, 2017 and 2018. He is Board Certified in Orthopaedic Surgery and is a member of the American Academy of Orthopaedic Surgeons, the American Board of Orthopaedic Surgeons, the Newport News Medical Society, and the Medical Society of Virginia. While Dr. Fithian practices and enjoys all aspects of orthopaedic surgery, his special expertise and interest is in shoulder surgery. Dr. Fithian has been proud to call the Virginia Peninsula home for 26 years. His favorite pastimes when he is not working include outdoor activities and traveling with his wife to visit his four grown children in Raleigh, New York City, and California. In all of the orthopaedic services that he renders, Dr. Fithian is committed to providing quality care that is customized to meet the needs and personal circumstances of each patient.